It is raining out... hard rain. The plants and trees are going to love it. I love the smell in the morning after a refreshing rain. This is number three in the simple thank you series. Supplies: Stampin’ Up! Naturals White cardstock, Inkadinkado Perennial Prints and Thank you, Stampin’ Up ink spots. I sat down and made Christmas cards this past weekend, I always seem to try to make too many different designs and it feels a bit overwelming so this year I am going to try to do about 6 or 8 of about 4 designs. I also made a Thank you card which I will post in a few days. it felt great to sit down and just card for a couple of hrs. Happy Saturday, it is a beautiful morning here but alas fall is sneaking into the air. I had a wonderful walk/run with a cute little dog I volunteered to walk for a couple of days. Supplies: Cream and brown cardstock, Designer paper-unknown, Paper Inspirations-Birthday Joy Calligraphy, Memory Box-Vine Border, misc gems. I say this ALOT, but I picked up some cute Christmas paper yesterday. I wanted to sit down and make something right then and there. I don't think my co-worker would have been happy with me though. I feel a card coming on, you know that feeling where you might just go insane if you don't cut some paper and ink a stamp or two. So I might have something to show in a few days. I still have a couple of simple cards left to post as well as another card with this very same stamp. Darker mornings and the sun hides a little sooner at night, the evenings are cooler too. Summer is slowly fading and I have been feeling the need to make cards with Autumn and Halloween themes. 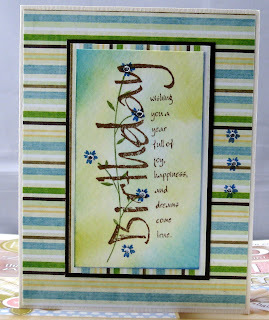 This is one of the super simple cards I made, I love ink spots, those mini version of a real ink pads. It makes it so easy to just drag them across the paper. This image does not show it very well but I used three colors, a vibrant yellow then a light orange and a darker orange/red for the flower. I finished it with a misc gem. I can't say that these are my favorite type of card but you never know unless you try and in a pinch I would still rather send out homemade cards. Supplies: Stampin’ Up! Naturals White cardstock, Inkadinkado Perennial Prints, Inkadinkado-Thank you, Stampin’ Up ink spots. Almost a whole month, I think that is a record for me even if I have only been blogging a short time. So much has been going on, a new computer, a failed external hard drive with all my card images on it and a vacation that was beyond fabulous. Cards have gone by the wayside for the summer for the most part anyway, although I did manage to make some very quick Thank you cards and a couple of cards that were created because my sister Barb just needed to craft when I was there. Thank you Barb and Mavis for an wonderful crafting afternoon. I made 4 quick Thank you cards before heading out on vacation, I used this project idea from Stamp TV and Gina K. I think they are the fastest cards I have ever made, I will admit that I messed up 2 before I finished the 4 cards, good thing it was only a single page of cardstock in the end. I am pretty sure there could be some amazing color combinations which this technique. Vacation was great, a wonderful few days on the Oregon coast, we as a family forgot to use the camera, I think I pulled it out one day on the beach and took some very second rate images not worthy of posting. Then my husband and I headed to Vegas minus young son who I know was having a great time with family in the Fraser Valley, this time the camera... did not come out of hiding at all. Finally minus young son and husband (I am so spoiled) I had a wonderful visit with friends and family all over the interior of BC, forgot the camera! Alas reality calls and I had to return to work, there is a bright side, it is still summer, the sun is still shining and thank goodness for weekends. Supplies: Stampin’ Up! Naturals White cardstock, Amuse Stamps-Jasmine Silhouette, Inkadinkado-A special Thanks to you, Stampin’ Up and Memento inks.